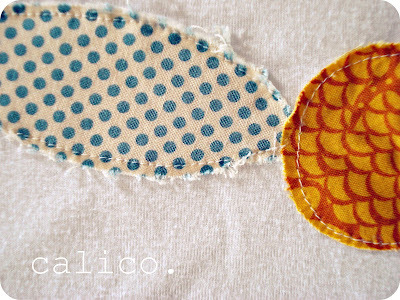 Iron pieces of blue and yellow fabric to some Wonder Under, following Wonder Under instructions. Draw the shapes of the snitch and its wings onto the paper backing. 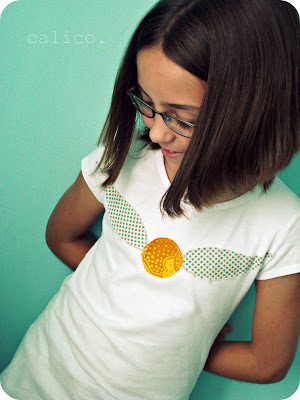 Peel off the paper backing and iron the shapes onto your shirt, following the Wonder Under instructions. Now sew around the edges of your snitch with a straight stitch. Put some Fray Check right on your stitches so it doesn't fray too much in the wash (this step is optional). This is a very cool shirt. She has a one of a kind. Sah-Weet! I had no idea that I was chatting away your cherished blogging time today..sorry. LOVE LOVE LOVE the shirt...I may have to make me a really big one...don't know if that snitch will look so good centered in between...well, you know. Harry Potter lives on...for now. Can't wait for the next movie. You should sell those on Etsy...you'd make a small fortune of galleons, I'd bet. 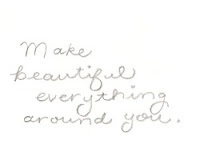 (i'm so cheesy) xo! I saw their shirts after the movied yesterday! Sooo cute! I love all your projects, but this one is oh so cool. I'm featuring your blog on mine, spotlighting cool blogs with back to school projects.... if it's not ok, just let me know! some posts need their very own like button.